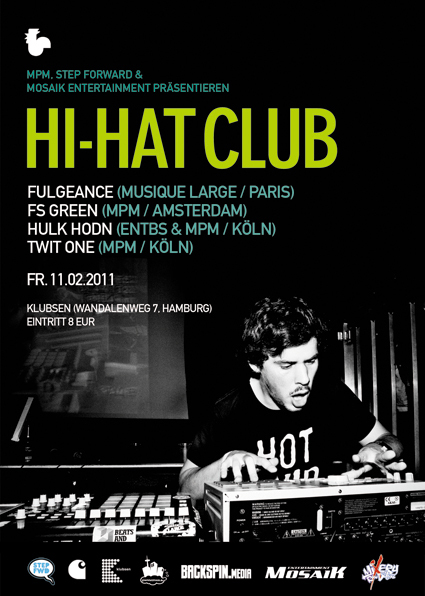 For the first time the Hi-Hat Club, a new platform for beat producers initiated by Melting Pot Music, enters Hamburg and showcases some of the freshest European rhythm constructors. The French magician Fulgeance plays one of his euphoric live shows. Before and after FS Green from Amsterdam and Hulk Hodn and Twit One from Cologne rifle through their record bags to mix some of their own tracks and thrilling news from the global Hip Hop underground. Come by and shake a leg.